I have been so lucky that I have had the best, sweetest mom ever! She is almost 89 years old and now has to live in a Skilled Care facility. It is very difficult, but I know she is in good hands. When she was able, she loved to Tole Paint. Anybody out there remember or know what that is? And then she got into painting resin Santa Clauses. We decorated her room with several of the Santas that she painted thru the years. It gives her great pleasure when one of the nurses or staff comment on her Santas! Mom was always happy in her craft room, so I guess it was inevitable that I would be too! And now.... on to the card I made for her! 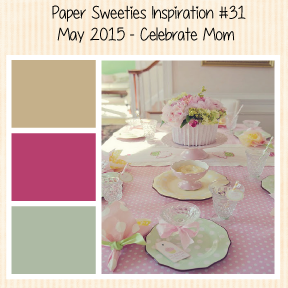 I got my inspiration from the pretty pink and mint colors of the inspiration photo. TIP: After I stamped the flowers, I lightly outlined them with a light gray Copic Marker. This just adds some nice dimension. Don't forget to visit my talented Paper Sweeties Teamies! Gorgeous! Your mom will love this. Thanks for the tip about outlining the stamped flowers. It really does enhance them beautifully! Hugs! Love love love this! LOVING what you did with those flowers!!! And, huge congrats on your win over at Curtain Call!!! Oh my goodness ... love this darling card 'much'!!! Gorgeous use of stamps and love the seam binding bow! Such a beautiful card for your mom. I love the gorgeous stamped flowers Andy that wonderful bow! How wonderful that your Mom "Tole Painted" and painted Resin Santas too! I know my Mom's knitting and drawing handmade cards for her friends greatly influenced my creativity! 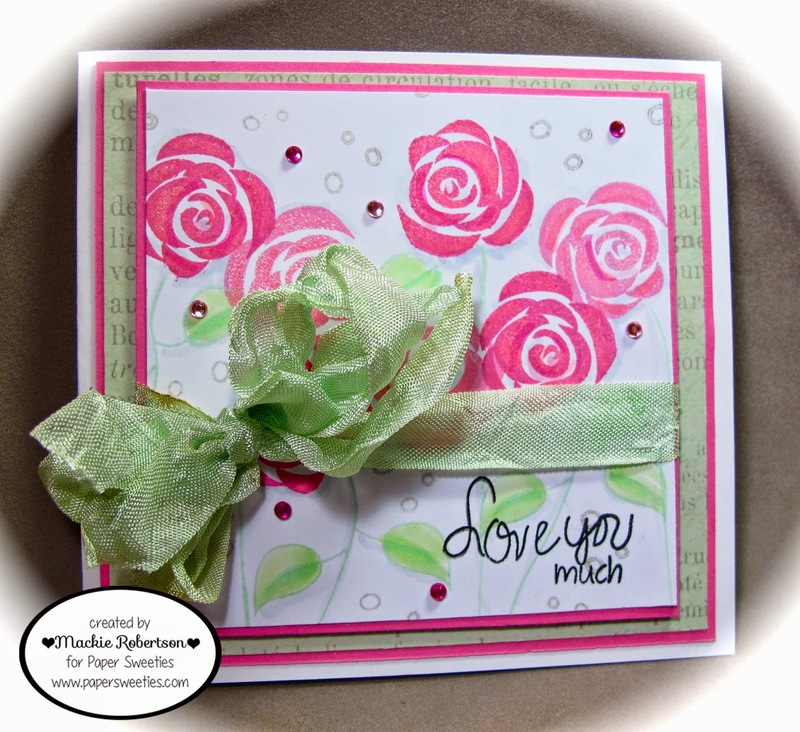 I hope you enjoy Mother's Day and I love this beautiful card you created for her! Great tip about outlining the flowers! I need to try it! This is a dreamy and feminine little work of art!! So pretty, Mackie!!! Beautiful stamping! Thanks for sharing your beautiful card. LoVe how you added the grey to the flowers. Mackie, I just ADORE your card! The roses are beautiful and the ribbon is simply perfect! So pretty Mackie! Love all the beautiful blossoms and fancy bow!